Is Internal EA Memo Taking a Jab at Dead Space Designer? A memo from EA Games' President congratulating Visceral Studios for Dead Space 2 may include a not-so-thinly-veiled potshot at former EA employees. Please join me in congratulating the Visceral Studios teams at Redwood Shores, Montreal, Melbourne and Shanghai for creating an unparalleled experience in Dead Space 2. The game we created in 2008 was recognized by critics as iconic - what we didn't expect is that the team at Visceral would leapfrog that first effort with a bigger, better, and much, much scarier second game that has secured Dead Space as a bona fide franchise. Dead Space 2 launches with a 91 Metacritic - higher than DS1. The New York Times has stamped it as the first big blockbuster of 2011. Dead Space 2 is a game our entire company can be proud of. The team at Visceral Studios faced down adversity and never got sucked into petty competition. Their answer was simple - they just made a better game. Congratulations! That last bit about how the studio "faced down adversity and never got sucked into petty competition" may say more than the words themselves indicate. Reading between the lines, it could be a dig at Visceral Studios' General Manager Glen Schofield and COO Michael Condrey, who each left EA in 2009 to join rival publisher Activision's new San Francisco studio, Sledgehammer Games. 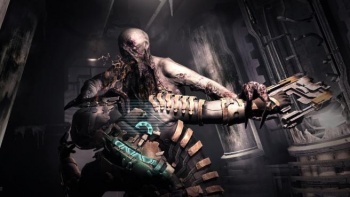 Schofield and Condrey were instrumental in the success of the original Dead Space and when they left, EA was quick to deny suggestions that the pair's departure would damage the sequel's potential. Given the review scores, EA seems to have been right about that at least.